I spent the last two days at the TechSoup Global Summit getting inspiration overload about social media, networks, social network mapping, networks of networks, global peer learning, building a sector, nonprofit technology, and many other ideas I’m passionate about. But it wasn’t just the ideas, it was also the people and making connections to colleagues I’ve known for more than a decade and connections to new people. I think that TechSoup Global’s three leaders – Daniel Ben-Horin, Rebecca Massisak, and Marnie Webb – have been modeling this practice. That became clear to me in the session at the end of the day where we were identifying concrete action steps for some of the ideas discussed over the past day. 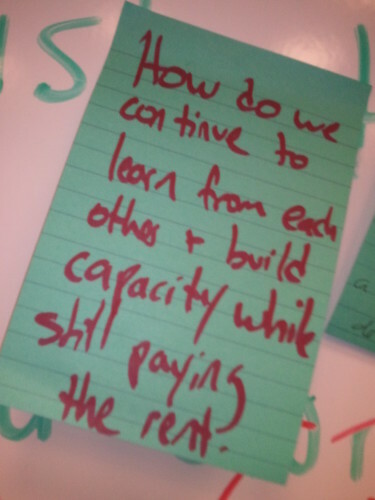 One of the ideas that emerged in our session was #kngow (I’ll describe that in a second, but a way to embed translation in peer learning and knowledge sharing around nonprofit tech capacity building). We were grappling with the question, “Who is going to do this massive task?” On the one hand, we could all say, “TechSoup Global can go do that! and we’ll sit back.” On the other hand, we could all go back to our respective homes and work towards that in a chaotic, uncoordinated, and distributed way. What emerged as the idea that TechSoup Global, using a networked mindset could facilitate this to happen. Ground Rules to Encourage Generative Behavior: At the opening event, we were told not to sit with people we already know and to make an intentional effort to introduce ourselves to new people and have a conversation. In a very funny way, Alan discouraged us from doing that by telling us that when we sit with people we know, we are not open to making new connections and form cliques. Being/Doing Structure: The first day offered more structure. 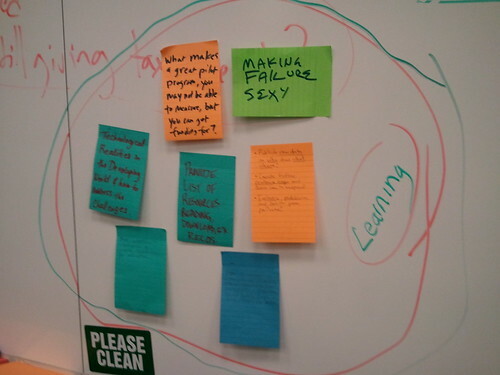 There were 12 topics organized into three different themes. This mean that roughly there would be 100 or so people in section. For each session, a moderator introduced the topics. 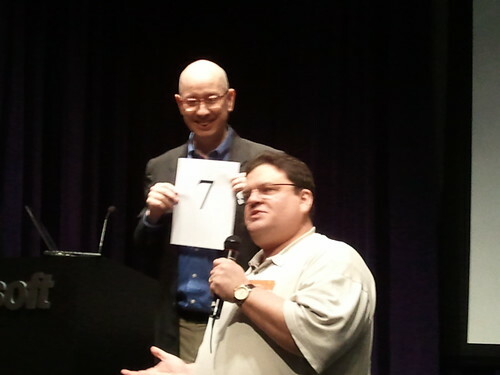 There were two framers who raised a question or idea related to the theme. Next, “Fomentors” or moderators were asked to pick a topic related to the theme and frame and facilitated a small group discussion and ask someone in the group to summarize and report back to the whole group. I was a fomentor for two sessions: Social Networks for Social Change and Peer Learning. We were also given permission to hack the structure if it wasn’t working. For example, it got noisy in one of the rooms – so as a fomentor, I took my group into the hallway. In another session, the moderator had the small groups work on framing a question and then brought the whole group back together again – and had the different small groups work on the answer. The next day was all about practice, action, and doing. But to get there, there was a bridge session at the end of the day 1 where we used sticky notes to identify session ideas for Day 2. On Day 2, they found people in the network to lead those sessions – mostly recruited a few minutes before. These were called “Deep Dives.” I was asked to lead two – one on social media best practices for network building and one on failure (stay tune for the post). Overall, the Summit was designed for people in the network to connect, learn from one other, and spark new connections. There was a good structure with enough openness to allow this to happen. This allows you to go deep, to get know other people around the table versus getting content stuffed into your brain. Even during lunch or breaks, you could bump into someone, have a conversation, and realize points of connection. I felt that I didn’t leave this summit with a stack of business cards I won’t look at, but with deeper connections to people. Alan used a term, “love bomb,” which means giving people public appreciation. I loved the term, although it does have some critics and can be used for bad purposes as well as social good. But taking away the negative references, it is a behavior that can be modeled and encouraged in networks. Here’s three good examples: Care2 does a “Shine A Light” on members, ShareYourStory, and Drop A Love Bomb. In an organization-centric approach, there is laser beam focus on results and value. That’s important to networks as well, but in order to achieve it, you must also value connection and learning. This is what makes measurement of networks complex. This was a theme that surfaced during both days in different sessions, including outcomes versus outputs and the discussion about philanthropy. That’s just a little bit of the inspiration overload I got from the past two days. While I got lots of ideas for a few blog posts, I anticipate that the TechSoup Global Network will be vibrant. 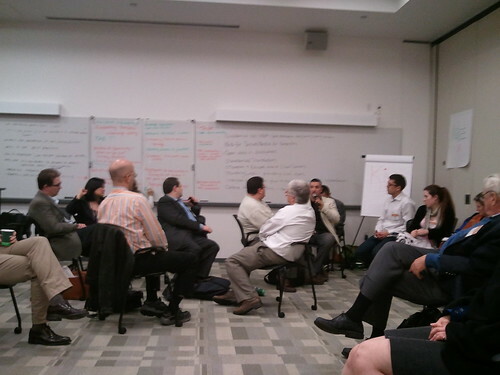 Want to read more about the TechSoup Global Summit? Here’s round up on their blog. 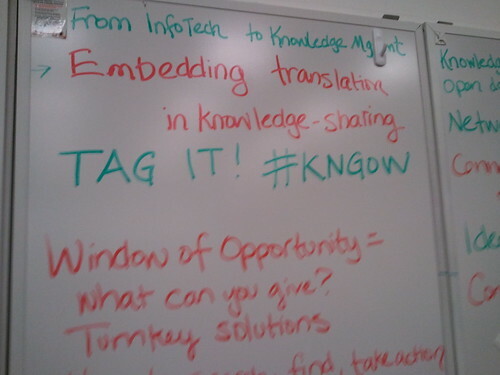 Wow, this sounds like it was a great summit and I look forward to reading more with the #KNGOW hashtag. Looking at the question that was identified there at the end, How can our learning make a global impact? I wonder what is meant by impact. I’m assuming that impact will be different for different networks or NGO’s? I bet much of this was discussed and I’ll look to future conversations for more information. Thanks for being posting info about TSG 2011 so quickly. It’s been great reading the blogs. Thanks for the detailed sharing regarding to this summit! It has beenions since I’ve seen you. Somehow, I came to you blog. It’s an excellent way to share. I want to blog. Can you suggest a tutorial or site that can help me get started?